For the past three weeks, I have attempted to feature the Concert Band; however, I have messed up each time with incorrect camera settings. Yesterday, I managed to capture the video 'with' audio. This number features the trumpet section which consists of Ella Brown (Grade 11), David Ubber (Grade 10), Eva Redmond (Grade 11), Gala Holm (Grade 9), and Sachaa Rudrum-Bhimji (Grade 7). I am delighted and very lucky to have a full section as three trumpeters graduated this past June. Our new additions are terrific. They are doing some lightning licks in this piece which is carried along nicely by the other band members, and the high C at the end is executed by the section first chair, Ella. As the school year develops, I hope to turn up the heat and get the tempo up to 138; that's about 30 beats per minute faster than this performance! I know we'll accomplish this goal in time for the annual Spring Fling Concert. Wish us luck! 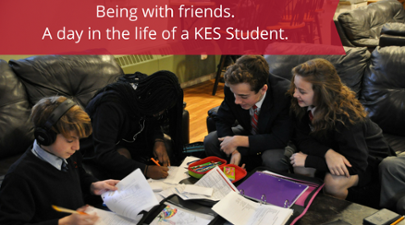 Academics, friendships, and artistic options - just some of the reasons to be here. Find out more in our PhotoJournal, A Day in the Life of a King's-Edgehill School Day Student.